As we approach the end of the year (I know, it's too soon), I thought I would take a moment to reflect on the EnterpriseIQ RealTime products. 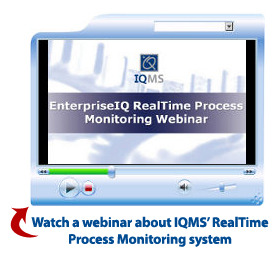 For those who have been with IQMS awhile, you may recall the genesis of our RealTime Machine Monitoring system. It has been going strong for more than 15 years now, with more than 15,000 individual machines reporting at more than 500 customers' facilities. IQMS' Automation Department has been busy this year. We've been working on some cutting edge applications: RealTime™ Process Monitoring with PLC communication, Android phone applications and EnterpriseIQ shop floor applications for the Android 3.0 tablets! These applications are harnessing the latest technology to transfer data instantly from the shop floor to the EnterpriseIQ manufacturing ERP software so you can make real-time adjustments instead of reactive recoveries. Below is a look at some of our recently released projects that are significantly assisting our clients in staying lean and competitive, as well as a sneak peek into what is in the pipeline. I attended my third straight MAPP Benchmarking Conference last week, October 27 and 28. A two-day event filled with industry statistics and trends, operational best practices and market forecasts, I have to say it was the best event I have been to so far. The attendance was the best I have seen which is a credit to MAPP Executive Director, Troy Nix, and his boundless energy and enthusiasm for the organization and the executive team led by President Matt Hlavin of Thogus Products Company.